James Marsden would like you to know that, despite his role in “Hop”- which bows on home video on March 23 – he is not an Easter Bunny wannabe. But thanks to his dad he’s pretty adept at finding hidden eggs. Since 'Hop' first came out, what kinds of reaction have you gotten from the kids who saw the film, then encountered you later – are they giving you lists of the Easter candy they want? Well, it was a mixture of, 'Hey, it's the guy in that movie,' and 'Oh, he's that weird human Easter Bunny guy.' 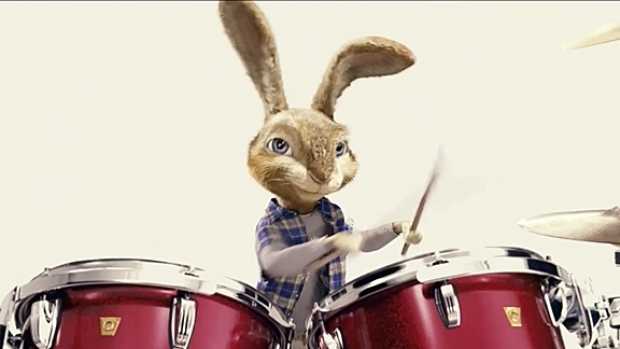 It's an interesting character, a guy who's in his mid-30s and still lives at home and wants to be the Easter Bunny. It might be a little creepy to some. I took this movie because I have a six-year-old and an 11-year-old and I wanted to be a part of something that I could take them to the premiere of, and that they could enjoy sitting on the couch and watching it with me. But it's pretty cool: you always want people to see your stuff, whether that's a family movie or any type of film and so when people recognize you from it…Kids from my kids school, I'd walk in and they'd point at me and say, 'Look, it's the guy from "'Hop.'" It just makes it worthwhile and fun. This could be a film that just gets passed on and on – 20 years from every kid past a certain age may have seen it on home video or TV. Are you ready to get that Easter Bunny reaction in another quarter century? I think maybe the thrill might be gone by then, but maybe there will be another Easter Bunny movie between now and then, hopefully. When I took this on I realized that there really hadn't been any movies about this holiday. Christmas has been done. Halloween has been done. Even Independence Day, but this is one that hasn't really been tapped into. So I realized that I would be not only the first human Easter Bunny, but the first person to be a part of an Easter Bunny-themed movie. So that was kind of cool. Do you have a good, out-there Easter story? It's not a holiday that often comes with great after-the-fact stories. This is a funny story: my dad, he laughs about this now, but we used to have these egg hunts. And you know those little plastic eggs where you could open them up and put things in them? Most people would put candy in them or whatever – this is like after the Easter Bunny came and you got your basket. Well, my dad and my aunt would set up their yards with these plastic eggs, some filled with more candy and some filled with dollar bills. So it was really mean if you think about it, because one of the classic ones had, like, a $10 bill. The golden egg was out there somewhere, and all the kids knew every year that there was that special egg with more money in it, so it became this GreedFest of kids just racing to find the $10 bill egg. He'd just sit back laughing while we got in fights with each other. So yeah, it was sort of a mean thing for my dad to do, but it's funny to think about now. You've got a nice side gig going playing Criss on “30 Rock” right now. 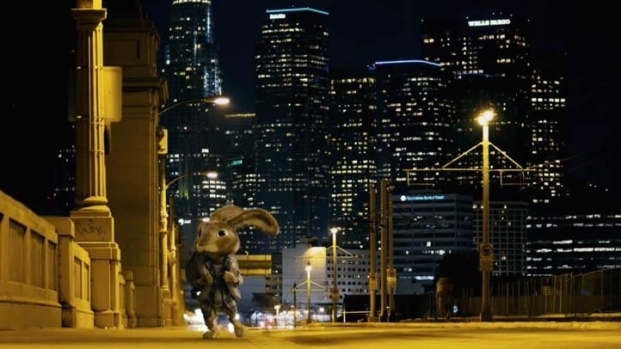 Russell Brand lends his vocal talents to a bunny who must enlist the help of the human who hit him with a car to save Easter in this live action/CGI film. Yeah, that's been fun. I've always loved that show. I think the writing is so smart, to the point where I think it's like a work of collective genius, and obviously the pedigree of people that they've had on the show – like I'm stepping into Matt Damon's shoes after he's left. So it’s been pretty cool. It's been fun to play her new love interest who's a bit of a dope – but a lovable one. You know that playing a Liz Lemon love interest your time is probably fleeting, right? There's a little bit of that. I know that the ice breaks right around the corner, but I'm not steering the ship in any other direction. First of all it's the sixth season, and I don't get the script until the week before and so I don't really know where the character is going and where the relationship is going. I don't know how they end up, honestly, but yes, if history has anything to say, staying with her is certainly not something to count on. Russell Brand is the voice of E.B., heir to the title of Easter Bunny. But like most kids, he shuns the family business to chase his dreams in Hollywood, before returning home when Easter is threatened. Opens April 1.